Get your wiki up and running without any coding or IT help. Use ProProfs corporate wiki software to create documentation from scratch or build wikis by importing HTML files and Word docs at a click. Publish wikis online or download as PDF. Update content instantly with all your work saved in revision history. Change the design at a click. Customize freely with CSS & HTML. Brand your wiki with customized logos, background images, layouts and templates. Dig deeper to use CSS styles and HTML and create customized headers, cover pages for your wikis. Get full white label with no mention of ProProfs anywhere in your corporate wiki. Empower your teams to work together by keeping information organized and accessible in a centralized enterprise wiki. Manage assignments and workflows easily by assigning roles such as editors, contributors and administrators. Track all progress under revision history. 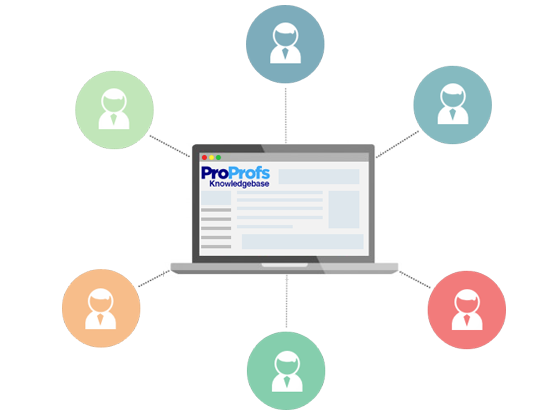 ProProfs ensures that power users get powerful features. Integrate with popular tools such as Zendesk, Google Analytics, Wufoo and more to get more out of your wiki. Enable single sign-on, create a private wiki, set-up custom domains at a few clicks. Gather feedback from readers and get centralized reports in your inbox. Enterprise wiki software are perfect for improving collaboration and knowledge sharing among employees. The wiki functions as 24/7 available resource and is helpful; especially, for new employees who want to quickly look up company best practices, procedures and policies. Important conversations between employees, that are usually lost in the heap of emails, can also be recorded and stored in an internal wiki for future reference. You can use a personal wiki software, to easily capture and record your learning. You can use a wiki to do a number of things, from creating a digital repository of your research, making notes for a book you're writing or simply keeping track of your personal projects. Updating the wiki is also easy as you can store information in any format such as text, videos, audio files. Best you can create a completely private wiki or share it publicly on the web. Create well-documented wikis, with a structured table of contents, that serve as user manuals and product guides. Facilitate employee knowledge sharing & boost trainings with an effective corporate knowledge repository.